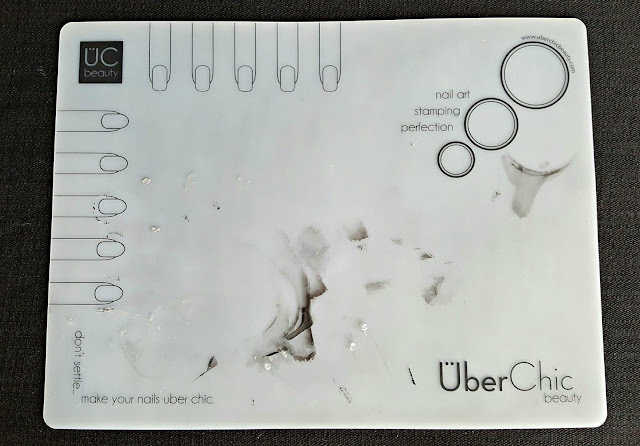 A long while ago I got myself the famou Uber Mat by Uber Chic Beauty and since I seriously started nail art, it has always been laying there, under the mani craziness, receiving all the dirt and garbage coming out of all the inspiration and trial and error. This week I happened to stop for a second and I just realized how amazing it actually is. That is why I thought of doing my small review of it. If you don't feel like reading the whole text but still want to know my opinion about it, YOU CAN GO BUY IT RIGHT AWAY. The most beautiful thing about it is that you do not have to worry about ANYTHING you can stamp, scrape, paint, splatter or do anything with the nail paint and acetone and nothing bad will happen to your furniture. Believe me when I say that I make a HUGE mess when I paint my nails, and I am sure I am not the only one. 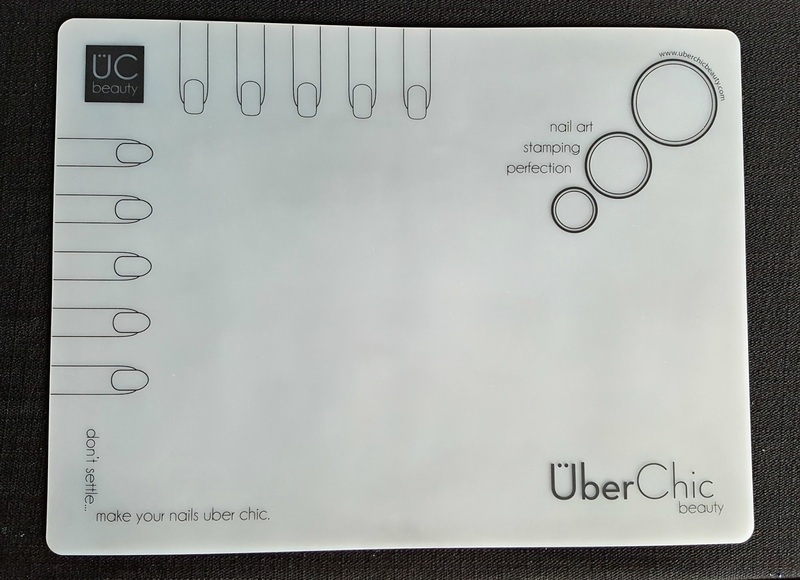 It is perfect for revered stamping as you can see the images with no difficulty and the nail images on the mat makes it even easier the size the amount of polish needed. That is my mat after a tiny little stamping and at that point I had already picked up all the garbage that was laying on it. ...and a couple acetone wipes and lint roller rolls later...It is back to looking like a brand new and unused one. It doesn't take a single effort and the mat just saved your furniture. I do not even want to imagine the mess my table would look like if I didn't have my mat. Also, it has this soft texture that doesn't make it stick to your arms or move when you don't want it to. It is also easy to keep in a smaller space as you can fold it as you want and as soon as you unfold it, it will be back to normal. Personally I don't fold it because I leave it 24/7 on my nail desk and I do think it looks beautiful there. Hope you could take advantage of my review.